If you're trying to get the information you need about commercial truck financing you may be having some difficulty. They will hang up on you. It's better just to lie to you about the rates and payments - once we check your credit we can just make up some BS excuse why the costs are going to be higher than what you were first told. Of course, by the time you've sent in your credit application, you've already picked out your truck and the dealer is going to be pissed if you don't get it financed pronto. Exclusive Bonus: To quickly learn your payments on a commercial truck, download the free guide to payments on commercial truck loans and leases. 1. Down payment: how much will I need to finance a commercial truck? 2. Payments: how much will they be? There are more questions than that, obviously, but these are the most important ones that we find customers tend to ask about financing a truck. Here's the deal - if you can't get straight answers to these two basic questions, you can't make plans on what you'll need to allocate for your business. This is a big deal - it's not like you're buying some $19.99 potato peeler off of the TV - making the wrong decisions on your truck purchase can affect your livelihood. With that being said, let's talk about how to go about financing a commercial truck, and what the costs are likely to be. In taking a look at what you'll need in order to finance a commercial truck, the first step is defining what you're actually looking at financing. The first step is categorizing the truck, because depending on the type of truck, and the type of work it's used for, financing options could be a little bit different. The rules are slightly different depending on what type of truck you are buying. That's because some equipment finance sources will not touch long haul trucking deals, but other finance sources specialize in them. ... buying a semi tractor to be used with a dump trailer? That's a vocational truck deal, not a transportation truck deal. ...but ask them for rates on an older truck and they get all wishy-washy on you and whine if they can't find good "comps" for your collateral. That's why... as we're going through all the different ways to figure out costs, I'll be throwing stuff at you like, "well, if the truck is old, payments might be this, but if it's new the payments might be that." Of course... maybe you just want to get going on a quote. We can help you with that. Now that we're getting into the nitty-gritty, I'll give you some different scenarios. There's all different ways to skin the truck financing cat, so these numbers won't always be 100% exact. This will give you as close of a guess as is really possible based on different scenarios. Vocational trucks are asier to finance than trucks that are used for long hauling. Many equipment finance underwriters' guidelines say, "we'll finance just about anything in the world, unless it's a long-haul truck." Many of the companies that do finance long haul truck companies won't work with owner-operators. If you've been in business a while, have good cash flows, you're buying a newer truck, and you have reasonable credit, sometimes you won't really need a down other than the first payment. As risk factors pile on, the amount of a down payment you'll need goes up. 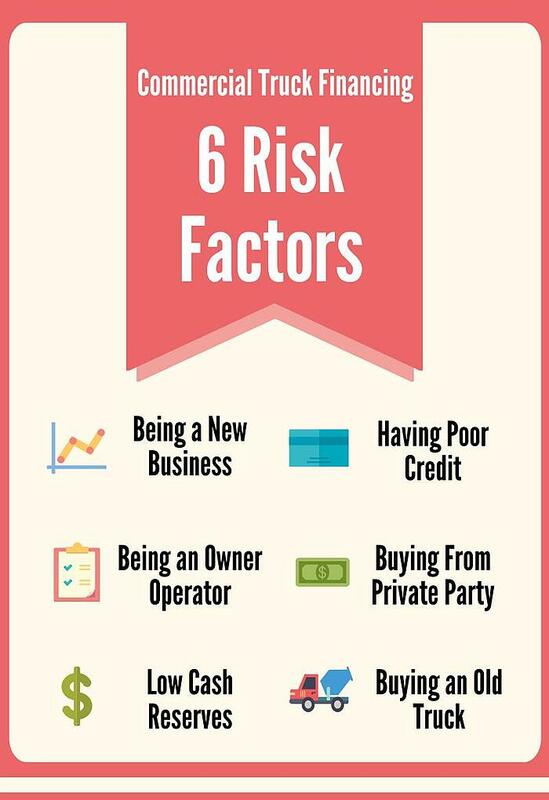 Some of these have a bigger effect than others, but in most cases the down payment you'll need if you have any of these risk factors will range from 10% to 25%, though some programs will look for 50% down or collateral. How much each of these things matters depends on how much risk they add, and there are some other considerations as well. We get a lot of questions about the different risk factors and why they matter, so let's go over them. Can a New Owner Operator to Finance a Truck? New owner operators generally have the toughest time getting approved for truck leasing. Most financing companies won't consider owner operators that don't have 2 years in business. We've compiled a list of the best programs for new owner operators... but your situation will determine which program is best for you. Before you've been through some of the challenges, you won't really know what to expect, which makes the risk of default higher. It's certainly not impossible for owner operators to get financing, though. If you have collateral, like home equity or other vehicles with a lot of equity, you should be ok even with bad credit. There are zillions of other scenarios, but these are the basic things we run into. How Much Does Credit Score Matter for Commercial Truck Leasing? When you get a commercial truck, credit score matters more in determining your payment than whether you'll qualify. Still, bad credit can sometimes keep you from qualifying for commercial truck leasing. If you've got bad credit and minimal down payment or collateral, it's going to be pretty hard to find someone who will finance you. We talk to people with poor credit sometimes who ask if there's any way to get the down payment below 10%, and the truth is, that's usually not a very likely scenario. 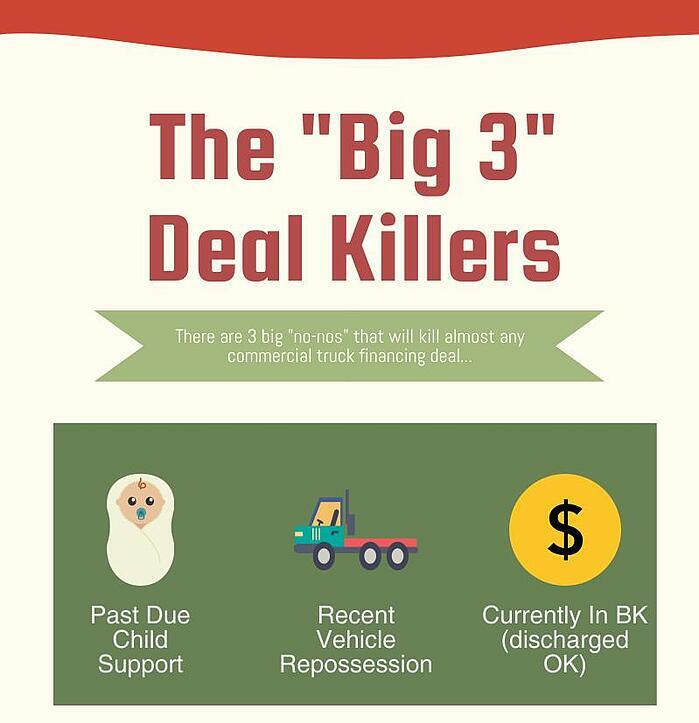 If you have at least some money to put down, or some sort of collateral, you'll usually be able to lease a truck even with miserably bad credit - unless you've got one of the big 3 deal killers. Can You Finance a Truck With Low Cash Reserves? It depends. If you have reasonable credit, and aren't buying the oldest truck, there are some application-only underwriters - which means nobody is going to look at your bank statements. Like everything else we've talked about though, it really depends on the situation. Someone who isn't looking at your cash situation and is going to lend money to you has to compensate for that extra risk somehow - so they likely won't let you buy anywhere but from a dealer and usually won't let you buy an older truck. Can You Finance an Older Vehicle? As the age of the vehicle buying goes up, the number of underwriters interested in financing it goes down. You'll usually have no problems financing something less than 10 years old, and while it's a little harder to finance a 15-year old vehicle, most of the time you can get those deals done. 1. 20 year old equipment is going to break a lot more. If your truck is not working, neither are you, which makes it a lot harder to make your payments. 2. If you don't make your payments, the funder has to take your truck. It's a lot harder to sell a 20 year old truck than a 5 year old truck. Note: We run into this issue all the time. New owner operators naturally want their first truck to be the cheapest they can get away with - so they'll have enough money to start their business safely. In general, old equipment can be financed if we can make the deal make sense to an underwriter. Why is Owner Operator Financing Tougher? Lots of equipment finance companies say they finance trucks, but only if you have 3 or more vehicles. There's a lot less funders that will deal with a single owner-operator. The reason for this - if you've got ten trucks and one of them breaks, you have ten percent of your fleet off the road. If you've got one truck and it breaks, you have zero income until the truck is fixed. We can usually find a financing solution for you as an owner operator, but it's just not as easy as for fleet financing. Can you Lease or Finance a Truck through a Private Party or from an Auction? Truck financing is generally more difficult if you're not buying from a dealer - but like all situations, certainly not impossible. Roughly half of underwriters will only consider financing trucks when you buy them through a dealer. Hopefully, this guide has given you a good overview of what it takes to qualify to finance a commercial truck. In most cases, we can find a way to get your truck financed, and we'll give you clear direction and no BS. Ready to get financing on your next commercial truck? Call us at (866) 631-9996 or click on the image below to get a quote.